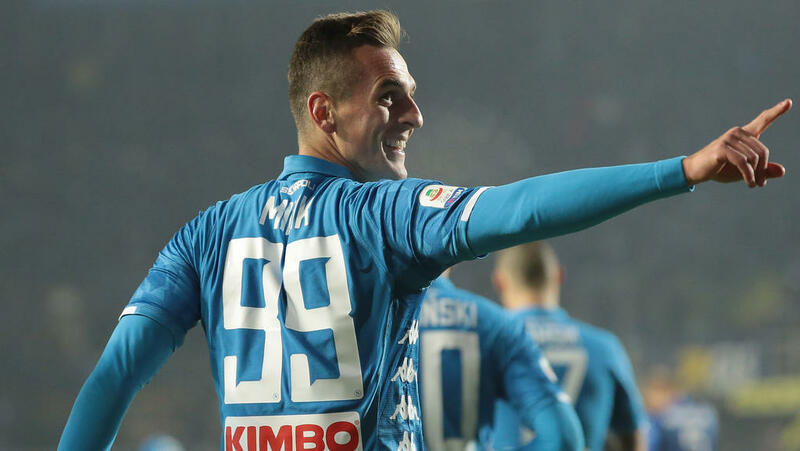 Polish forward Milik scored the winner five minutes from time shortly after coming on after Fabian Ruiz had put the visitors ahead just two minutes into the clash in Bergamo and former Napoli man Duvan Zapata had pulled Atalanta level 11 minutes after the break. Napoli close the gap on Juventus, who pulled 11 points clear with a 3-0 win at Fiorentina on Saturday with Cristiano Ronaldo scoring from the spot to bag his 10th goal in 14 games. Carlo Ancelotti's Napoli came out firing on all cylinders after their title hopes took a serious hit with a goalless draw against bottom club Chievo last weekend. The coach stuck with the same starting line-up that beat Red Star Belgrade 3-1 in the Champions League midweek. Captain Marek Hamsik started the move that led to the opener with just a minute on the clock, passing to Lorenzo Insigne who crossed for Spaniard Ruiz to tap in his third goal since joining Napoli from Real Betis. Insigne was ruled offside early as his volley rattled the bar with a lob shortly after the Italian international forward shot wide as he slipped. Zapata tested Napoli goalkeeper David Ospina in the first half with defender Raul Albiol also clearing off the Colombian after the break. But the former Napoli forward broke though on 56 minutes when Hans Hateboer headed the ball down for him and he blasted in from close range. Milik came on for Dries Mertens after 81 minutes and four minutes later had the winner and his fifth goal this season in the back of the net. Napoli move three points ahead of Inter Milan, who played out an entertaining 2-2 draw in the Stadio Olimpico on Sunday. Atalanta are in 11th position after their second consecutive defeat. Luciano Spalletti's Inter travel to Turin next Friday to take on Juventus in the hope of derailing their bitter rivals' title procession, with Napoli hosting second from bottom Frosinone on Saturday.